Doctors working with the Biograph mMR, Siemens Healthcare’s molecular MR technology with simultaneous image acquisition, have identified several disease areas in which PET/MR may increase diagnostic and therapeutic capabilities. Their findings are paving the way for new PET/MR protocols that will help enhance routine applications and lift medicine to a higher level of personalized care. Biograph mMR uniquely allows a combined approach to imaging not only anatomical and functional characteristics of disease, but also their biochemical characteristics. Prior to the advent of this system, integrating PET and MR technologies was considered nearly impossible because of the functional incompatibility of the photomultiplier tubes housed in PET detectors with the strong magnetic field generated by the MR. The key technology enabler was the development of detectors for positron annihilation capable of functioning inside the strong magnetic field of a clinical MR scanner. The scintillation crystal blocks in conventional PET that read out by photomultiplier tubes (PMT) are susceptible to magnetic fields and had to be replaced for integration with MR. The solution was the introduction of the new detector solution based on avalanche photo diodes (APD) in combination with lutetium oxyorthosilicate (LSO) crystals, which is suitable for use in strong magnetic fields. It is a key enabler for the simultaneous acquisition of PET and MR, as well as offering high PET performance. Another advantage of APD detectors is that they are smaller and lighter, thus enabling room to integrate into a whole-body 3-tesla MR with an adequate bore size. Commercially available in Europe and in the U.S., the Biograph mMR is already in use at installations around the world. The Biograph mMR may be an engineering marvel, but what does it mean for patient care? Doctors at luminary sites are making headway on the Biograph mMR, developing novel approaches to the understanding, diagnosis, and treatment of disease. Based on initial findings, physicians foresee the first routine applications in tumor delineation and characterization. PET/MR’s ability to detect small lesions in soft-tissue is promising for diagnosis and treatment of a wide range of cancers, including those of the head and neck, the liver, lung, and prostate, as well as endometrial, ovarian, and cervical cancers. “PET/MR is effective due to high soft-tissue contrast and the additional metabolic information, especially for primary tumor and local tumor recurrence, for example, in the liver. Overall, malignancies in the pelvic region will be a possible future application for PET/MR,” indicated Nina Schwenzer, MD, Management PET/MR Center, Department of Diagnostic and Interventional Radiology, Tuebingen, and Holger Schmidt, PhD, Managing Physicist, PET/MR, Department of Diagnostic and Interventional Radiology, Tuebingen Germany. 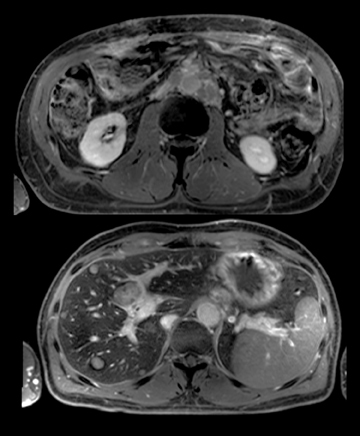 The advantage of using MR over CT for tumor detection in the liver is notable because MR is a more specific test for characterizing liver pathology than CT, said Bruce R. Rosen, MD, PhD, Professor of Radiology, Harvard Medical School, and Director of the Martinos Center for Biomedical Imaging, Massachusetts General Hospital (MGH), Boston, MA. Compared to individual modalities, PET/MR may pick up additional lesions in patients with extensive metastatic spread. “In patients with metastatic spread, the high sensitivity of diffusion-weighted imaging combined with PET may help identify additional lesions,” said Dr. Schwenzer. In prostate cancer, Dr. Lentschig has found that PET/MR assists with binary diagnosis for prostate-specific antigen (PSA) recurrence of the tumor. He anticipates it will also enhance detection of metastases in the liver, lymph nodes, and bone, as well as those in the brain and head and neck. In patients with multiple myeloma and lymphoma, “there is the benefit of the added contrast and the bone marrow where some patients with multiple myeloma all have bone marrow involvement where CT is not as good as MRI in discriminating,” said Alexander R. Guimaraes, MD, PhD, Medical Director of the Martinos Center for Biomedical Imaging, Massachusetts General Hospital, Boston, MA. There are several advantages to the simultaneous data acquisition enabled by Biograph mMR, including temporal correlation of PET and MR imaging data, reduced imaging time compared to sequential imaging, and cardiac and respiratory motion correction of PET data. Of these advances, MR-based motion correction for PET is especially useful for reducing the effects of misregistration caused by patient movement and physiological processes when imaging the lung, the upper abdominal region, and heart. In the Biograph mMR, tissue attenuation is obtained in an image segmentation-based approach. Depending on the sequence type used, air, lung, fat, muscle, and bones are segmented and provided according to PET correction values. In the head and neck region, attenuation correction is achieved with an ultrashort echo-time (UTE) sequence, which also provides segmentation of the bone. All other body parts are attenuation-corrected by a Dixon technique providing 2 images where water and fat are ‘in phase’ and in ‘opposed phase.’ This allows for reconstruction of fat-only, water-only and fat-water images, resulting in tissue segmentation of air, fat, muscle, and lungs. At MGH, doctors are using real-time motion correction with MR to directly impact the reconstruction of the PET data. “It shows specific sensitivity to small lesions, especially metastatic lesions within the liver,” said Dr. Rosen. Dr. Schwenzer and Dr. Schmidt believe MR-based motion correction could result in higher detection rates for small lung and upper abdominal lesions in PET images. Simultaneous acquisition of PET and MR images also provides the accuracy needed to differentiate radiation change or post-surgical change from residual tumors, indicated Pamela K. Woodard, MD, Professor, Radiology, Head, Advanced Cardiac Imaging (Cardiac CT/MRI), Division of Diagnostic Radiology, Cardiothoracic Imaging Section, Mallinckrodt Institute of Radiology, Washington University in St. Louis, MO. “In pelvic imaging, for instance, a lot of patients get PET or MR imaging as opposed to CT. In this case you have the simultaneous acquisition without the need to use the CT for attenuation correction,” said Dr. Woodard. The combination of MR and PET adds perfusion information to dynamic PET data. These techniques might play an important role for therapy adoption and when working with specific PET tracers. The advantage of the additional perfusion information is twofold: On one hand, it will be relevant in monitoring anti-angiogenic strategies. On the other, dynamic-contrast imaging plays an important role in tumor characterization and lesion detection. “This could be especially useful for developing new PET tracers or MR contrast media,” said Dr. Schmidt. The development of new PET and MR tracers brings doctors a step closer to delivering personalized medicine. “The next level PET/MR lends itself to is targeted-receptor oncologic imaging,” said Dr. Woodard. Physicians at Washington University plan to investigate receptors expressed by different tumor types to determine if certain receptors are present even without biopsy and whether a certain tumor is receptive to a specific therapeutic agent. “Our mission is to move toward a more personalized treatment of that tumor. We think we can develop a better biopsy by using these combined structural assessments, which you can get with PET and MR in a simultaneous acquisition. We can get a better assessment of the overall tumor behavior with PET/MR than from pathology alone,” said Robert C. McKinstry, III, MD, PhD, Radiologist-in-Chief, St. Louis Children’s Hospital, Professor of Radiology and Pediatrics, and Director, Center for Clinical Imaging Research, Mallinckrodt Institute of Radiology, Washington University in St. Louis. An important consideration in any imaging exam is exposure to radiation. Since only the PET component requires exposure to ionizing radiation, PET/MR significantly lowers dose exposure to patients compared to other imaging modalities with radiation. Some of the most anticipated advances PET/MR is expected to impact are in neurodegenerative disorders, such as Alzheimer’s, other dementias, and Parkinson’s disease. Recent data suggest that PET together with quantitative morphometry of MR may have the ability to discriminate mild cognitive impairment from a normal control,” he said. “I really think the combination of PET/MR is going to be the most specific early test we can give for patients who will undergo a rapid course of cognitive decline. 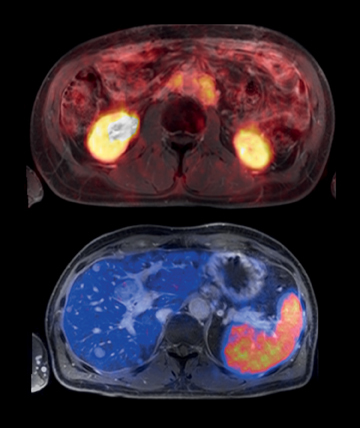 Also under way is the use of special techniques that combine metabolic information from PET with BOLD, fiber-tracking, and diffusion-weighted imaging. “The BOLD experiment is going to be very important. We are developing a delivery method for getting short half-life radiopharmaceuticals into the scanner room to look at PET measurements of blood flow, blood volume, and oxygen metabolism, and oxygen extraction,” said Dr. McKinstry, who expects PET/MR to open new opportunities in hemorrhagic stroke and stroke rehabilitation. For cardiac stress exams, simultaneous acquisition of cardiac MR and PET is somewhat like a one-stop shop. Dr. Woodard is preparing to conduct PET ammonia stress perfusion imaging, along with simultaneous cardiac MRI. She also thinks the system may be useful in assessing viability and providing direction to certain electrophysiology/cardiology procedures. With new radiopharmaceuticals on the horizon, there lies tremendous potential for cardiac PET/MR imaging. For example, Dr. Woodard hopes to assess a PET perfusion agent, flurpiridaz 18F (currently in clinical trials), for patients with known or suspected coronary artery disease, as well as other novel agents for atherosclerotic plaque assessment. Other emerging applications in development at MGH involve detailed visualization of contractile function in patients with diastolic dysfunction acquired on MR combined with the ability to quantify perfusion with PET. Inevitable with any emerging technology are changes to the way procedures are conducted. PET/MR, in the clinical setting, requires adjustments to workflow, affecting exam time; technical training; and a new approach to interpreting studies. There are pros and cons to patient throughput with PET/MR. Compared to PET-CT exams, PET/MR tests take longer. The total time depends on the MR protocols. After a whole-body exam, the MR protocol must be optimized to answer the clinical question. This may involve exams with very high spatial resolution, contrast studies, dynamic studies, spectroscopy, diffusion-weighted imaging, or functional MRI. The total scan time for a whole-body examination very much depends on the selected MR protocols that run simultaneously with the PET. In a minimum protocol, the acquisition can be as short as 20 min for a whole-body scan. However, users typically add more MR sequences in routine protocols to strengthen diagnostic confidence and make full use of the MR portion of the machine. “We have optimized our MR, and now a whole-body exam takes 60 min. For specific questions like prostate cancer, the high spatial resolution prostate exam, including spectroscopy, requires an additional 20 minutes,” said Dr. Lentschig. While Dr. Guimaraes likens the learning curve for PET/MR to the initial stages of PET-CT adoption, he sees distinct advantages in PET/MR imaging. As part of the learning curve, imaging technologists will need training in both MR and PET exam planning and in handling radioactive tracers. For physicians, reading studies will involve a larger amount of image data. “Similar to diagnostic PET/CT exams with contrast, the images should be read by a nuclear medicine physician and a radiologist,” said Dr. Schmidt. Physicians expect to make inroads in several other important areas using simultaneous PET/MR. “My hope is to be able to use PET/MR for breast cancer with dedicated breast coils, but we need a special breast coil to combine PET and MR for examining the breast,” said Dr. Lentschig. Another potential use for PET/MR is as an alternative to CT for radiotherapy planning, said Dr. Lentschig. Researchers at University Hospital in Tuebingen have already launched several clinical trials, designing radiation treatment plans based on PET/MR data. By enabling users to generate the location, function, and metabolic activity of organs in a single fused image, Biograph mMR is providing new opportunities for imaging. *MR scanning has not been established as safe for imaging fetuses and infants under 2 years of age. The responsible physician has to decide about the benefit of the MRI examination in comparison to other imaging procedures. Applications in PET-MR Imaging. Appl Radiol.